Before You Go Under the Knife…Have You Considered Gua Sha? Have you had fleeting (or perhaps not so fleeting) thoughts of running to the plastic surgeon’s office? For many of us women, the idea of cosmetic surgery can creep into our thoughts from time to time. As a dutiful skin care professional, I feel that it is important for me to educate women about effective alternative options. One of these options is Gua Sha. Gua What?! Gua Sha (pronounced “Gwa Shah”) comes from Traditional Chinese Medicine. Literally translated, “Gua” means ‘scraping away’ and “Sha” means ‘toxins’. 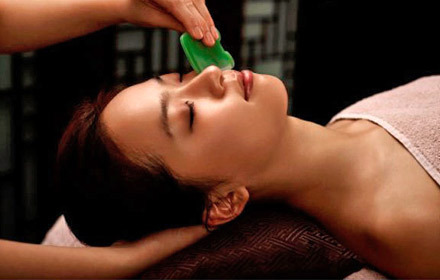 In terms of anti-aging, Gua Sha for the rejuvenation of the face and neck can be particularly effective. The practitioner uses a comb-like jade tool to perform a specialized face massage which brightens, lifts, and tones the face while smoothing wrinkles…sort of like an eastern facelift minus the whole actual going under the knife part. I firmly believe that if you want to be your very best at anything, then you must make a commitment to never stop learning. For this reason, I regularly participate in classes to further my esthetics education, amongst other things. Recently my friend and massage therapist contacted me regarding an opportunity to study Gua Sha for Facial and Neck Rejuvenation in NYC with Dr. Ping Zhang. Not being familiar with Gua Sha, I must admit that I was skeptical going in…it all sounded a bit too good to be true. I was very pleasantly surprised to see first-hand just how effective Gua Sha really can be! The massage is very involved, but results are pretty amazing. Want to see how it works? Check out this video of Dr. Zhang in action! ***Gua Sha will eventually make its way onto Balance Day Spa’s menu…once I have mastered it (give me time)! « How To Recover From A Holiday Binge!